I work at a company called 46elks, one part of my job is to make events that give us the opportunity to show developers that we exist. I learned about 46elks in 2013 during an event called Travelhack, organised by Trafiklab . In the same event I also got to know the company Oxyfi. In december 2014 I joined the 46elks, and in the spring 2015 we started to discuss good Hackathon themes. An idea to have a hackathon on a train was voiced by Andreas Kron. I contacted Oxyfi, who luckily were equally excited about the idea! I also talked to the train companies and Blå Tåget was able to help us. Sadly in 2015 there was not enough time to do the Trainhack . 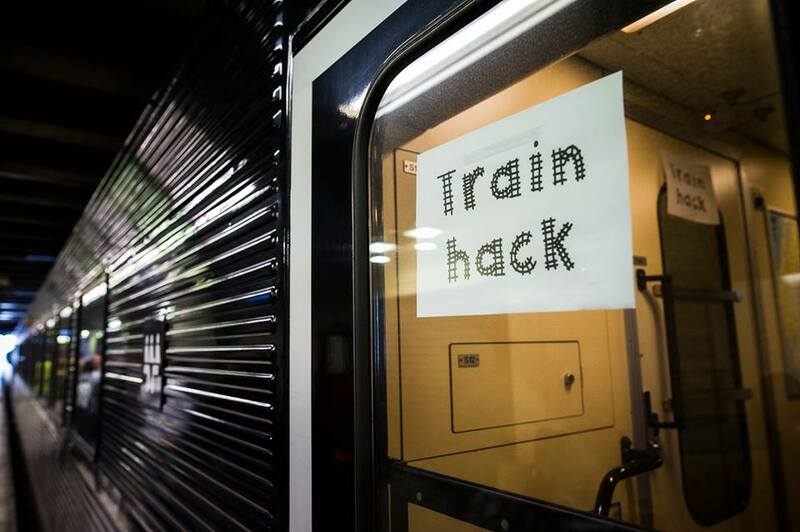 In the beginning of 2016 we felt that the time was right to push for a Trainhack 2016! I started contacted the Trafiklab , Oxyfi and Blå Tåget . The date was set to 2016-08-25 and the exact time (initially) was 08:55 because this was a date when the special conference wagon of Blå Tåget was available at a price that was safe enough even in case the event did not attract anyone. We decided to go public with the event before the summer, and the same day Dag König from Microsoft signed up and asked if they could be a part of the Trainhack . Some more private signups followed, diverse in ages and backgrounds. Some weeks later I found out about a company called eTraveli that was into community events as well. So I decided to ask them if they were interested in sending a team to the event. They responded with overwhelming support, they offered not only to send their team, but also organize the Uppsala end of the event. Everything felt perfect! The next day, we received information that Blå Tåget lost their permission to run trains. This was not encouraging at all, I halted the work of pushing the event on different channels. And started to get information from Blå Tåget , who promised that they would try to get the permission back. And luckily some days later they did it, great! However the timetable was taken from them and some of the departure times were given to another operator. The process of getting the times back was long but after some weeks the times were secured again. I started to push for the event again. Read more in GP and Di . After all the setbacks the luck was on our side again and the ride started to seem less and less bumpy . The first good news was that Oxyfi did manage to convince the train companies Norrtåg and Värmlandstrafik to share their GPS data with a Push API. It’s super useful when it comes to improving the delayed information for the drivers and the travelers. The second good news was that eTraveli gave access to a price API for air travel so it would be possible for the developers to make an Air+Rail price-comparison solution. After 4 days -2 days before the event- I got an email from Blå Tåget , that we did still not have any timetable! There was an option to wait for 2 more days, and hope for a timetable. If that would fail we would still have to pay for the train without being able to go anywhere. This was two days before the event so hotel and train tickets for traveling the other direction were already booked! I was in despair, and did all I could to get a timetable, but without success. After talking to Blå Tåget , a possible solution was found, however, it would require a maneuver not commonly used in Sweden today. The solution was that the wagons would be connected to a normal Tågab train that would depart from Gothenburg at 06:15 (instead of 08:55 as planned in the beginning). And at the station of Kristinehamn, the wagons would be disconnected, left in the station and the other part of train would continue without us. About 40 minutes later another train would have a 7 minute long stop at the station. During this time our wagons would be connected to that train and it would depart to Stockholm. Blå Tåget and Tågab worked together and were able to make this possible! And there was hope again! The new travel time resulted in new planning for the food on the train. But more importantly, it required that everyone attending the event needed to replan their mornings! So I stated sending information to all the participants about the new time. As an additional issue the pre-event place also cancelled, so I would also have to find the pre-event location, for the meetup, alongside the food and beverages. Lots and lots of things to plan. How were we going to arrange the food for the train? Nice people at the Creative Loop in Gothenburg provided a solution for the Pre-event space and supported us with how we could solve the issue with the food. As it turned out, the train would be standing on the platform during the night so we could leave the food on the train in the evening. So now we did have a plan that could work. Creative Loop also helped with sleeping arrangements for the Photographer from Nerdy Makers. The day before the event, Blå Tåget calls me and says "We have a problem...". My heart rate jumped to 220 bpm and blood pressure to 230/180! No, I can't take one more setback! The message in the phonecall continued "...but we were able to solve it quickly. ". So my body dropped the heart rate and blood pressure. However the adrenaline in my body would stay at levels I never have felt before. Due to all the issues with the train and the timetable, some other parts of the planning had lagged behind. One quite important part was to arrange prices for the winners of the event, so the day before the pre-event we only had one price and that was a ticket and boat trip to Junction hack in Helsinki (in November). I decided to buy several Raspberry Pi3s to have them as prices. I remembered that I knew someone from Webhallen so I decided to call him. As a result, Webhallen sponsored the event with some Raspberry Pis! This was great! Unfortunately, I was already on my way to Gothenburg but my colleague, who was sick and therefore stayed in Uppsala, could pick up the Raspberry Pis. Also, Trafiklab promised to arrange one more price for the team that would impress them the most. The water on the train cannot be used to make coffee because the quality cannot be secured, so all water needed for drinking and coffee had to be brought along by us. So me and Rob took all the empty PET bottles from my apartment in Gothenburg, filled them up and put them in an IKEA bag to carry them to the train in the evening. Then it was time to take care of the pre-event. Food needed to be arranged, thus, a quick run to the local supermarket for cheese pie was the solution. Later on, the travelers arrived and started to socialize. When the night was getting closer it was time to go and buy the food for the train. Everyone from the event decided to help so it turned out to be very easy to arrange. The Trainhack ers participating in the pre-event went together to the train station in Gothenburg, bringing the water bottles. There we met Joel, the train manager, who was going to help us along the way. We then went to Hemköp and started to buy things from the long shopping list. With the help of Matilda, from Microsoft, and Rob, from Nerdy Makers. The rest of the people stayed outside of the store and waited for us to return. After a while we were interrupted by a security officer. Apparently, the shop had been closed for 10 minutes already. So once more some adrenaline and pulse to finish shopping. When we came out of the closed store, the company had left because the guards said that the store was closed. As a consequence, we needed to carry the heavy shopping bags all the way to the train, where luckily Joel was ready to help us put the food in the refrigerators. After the food odyssey, me and Rob went back to Creative Loop , where we met Victoria also from 46elks. She was already working on the Trainhack logos to put on the doors and on the walls to make the event more visible. We also created the diplomas for the winners. After some hours we were finished and went to bed. I woke up early in the morning, no alarm needed, still lots of adrenaline in the body apparently. I took the remaining things and walked to the station. At the station I did see the train still there. And to my surprise the hackers started to arrive, and they all seemed happy and ready to go. Some minutes later Joel arrived and opened the wagons for us. Oxyfi arrived to support with the on board wifi. The day before all the antennas did not fit on top of the conference wagon so Blå Tåget added one extra wagon for us, just like that! So we did get a 45 ton 3/4G antenna on the hock. The extra wagon was also quite good for comfort since traveling sideways for hours is not for everybody. When the train departed from Gothenburg station, I could not believe it! I was in shock. My colleague Victoria reminded me to welcome everyone. At that point I understood that Trainhack 2016 was happening for real. During this time, Jakob from eTraveli , Viktoria from Oxyfi and Matilda from Microsoft , as well as Victoria from 46elks where arranging the breakfast buffet. With the buffet, the first Trainhack in the nordics was started. Victoria stated the group presentation where everyone presented themselves and what they would like to do. The onboard atmosphere quickly turned to relaxed. I felt that everyone knew each other, or was at least eager to do so. Some minutes into the trip the train was delayed some minutes due to a slower train ahead. To regain the lost minutes the driver did the best he could to regain the time, i.e. full acceleration and full braking and max allowed speed all the time. So basically driving like he stole the train, so we all sat tight and looked for things to hold on everytime the train would start to slow down. This gave some more experience and motion sickness to some of the hackers. At some point our fast internet connection started to malfunction. Luckily Oxyfi was on the train and started to work on figuring out what was wrong. The issue was first believed to be due to one of the new antennas. But later on it seemed like the issue was more complicated, with TCP errors that prevented new sockets to be created. The issues were never really solved completely during the trip. However, Oxyfi got lots of information of how the system could be improved in future. Especially when it comes to lots of short SSH sessions to Github, at the same time as there is live streaming going on from the same network. So for next year the connection will be greatly improved. Later on they found errors that does only apear when the train is running att speed. The result of this is that internet onboard from Oxyfi for current trains and the future trains will become more stable. When the train was getting closer to Stockholm, I did remember we needed to get all the way to Uppsala. I needed to buy 24 tickets from Stockholm to Uppsala. However, that was not too easy to do on the SJ webpage. Luckily we did have a SJ developer on the train and he helped me with buying 24 tickets both quickly and easy. He also managed to get Lounge access for everyone while we were waiting for the train to Uppsala. After arriving to the eTraveli office in Uppsala, we were welcomed by Jakob Rödström who presented the place and informed everyone that the food was served. All Trainhack ers started eating and kept on hacking. It got pretty quiet while everyone was trying to finish their projects. The time flew by, and at 16:30 the presentations began. The video shows the presentations of the projects. The winners can be found on the Trainhack site. For next year I hope we can have much fewer surprises. There have been some great things happening after the event, SJ showed an interest in being a co-organizer and all the organicers from this year have also been very eager to keep cooperating which makes me hope that everyone will join us next year as well. For the future prehaps a cooperation with other Trainhacks like Hacktrain.nl could become a possibility. Next year the rout might be different perhaps Mamö - Stockholm - Gothenburg could be an interesting route. If you are interested you can signup for information for the next year at Trainhack .